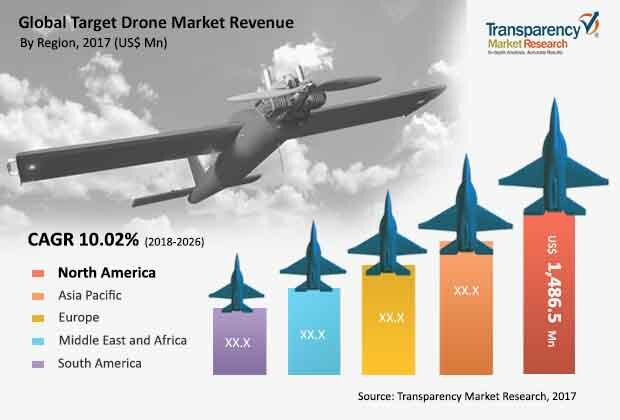 The global target drone market was valued at US$ 3,156.7 Mn in 2016 and is projected to register compound annual growth rate (CAGR) of over 10.02% from 2018 to 2026, according to a new report published by Transparency Market Research (TMR) titled “Target Drone Market – Global Industry Analysis, Size, Share, Growth, Trends, and Forecast, 2018–2026.” The report suggests that rising use of target drones across defense forces and higher applications as compared to manned aerial vehicles is likely to spur the demand for target drones in the coming years (2018 to 2026). As key players introduce new target drones in developed markets such as North America, Europe, and Asia Pacific, these regions are likely to account for dominant share of the global target drone market. Increasing popularity of the target drone, especially across economies such as China, Japan, and India along with the increased spending on defense systems and technologies in these countries, and presence of companies that produce target drones is likely to drive the Asia Pacific target drone market at a growth rate of around 10% from 2018 to 2026. Malfunction of a target drone can be fatal for the people present in the vicinity during testing or training of any combat mission system. Several target drone accidents have been reported in the past, causing fatalities. For instance, in 2013, in Florida, a large “QF-4” target drone crashed at the Tyndall Air Force Base. In 2014 as well, a target drone crashed in Holloman Air Force Base in New Mexico. Another target drone malfunctioned and collided with a guided missile cruiser during training in California, causing slight injuries. These malfunction incidents are raising questions on the reliance of aerial target military aircraft. However, well-established players are installing technologically superior systems in target drones to minimize and address this concern. For instance, in 2017, The Boeing Company announced that it will produce novel target drones named “QF-16” which include features such as a flight termination system that will destroy the drone in case of any technical error or in an out of control situation. On the basis of engine type, the target drone market is segmented into internal combustion engine, jet engine, and others. Internal combustion engine segment is expected to hold a market share of 47.65% in 2026 and expand at a CAGR of over 9% during the forecast period. The significant CAGR is because of the increasing popularity of various types of jet engines due to their prominent power-to-weight ratio compared to other engines. Furthermore, jet engines provide higher speed for the target drones. Companies including The Boeing Company and many more are using jet engines in their target drone named as QF-16 because of all these benefits. The Boeing Company, Lockheed Martin Corporation, Leonardo S.p.a., Northrop Grumman Corporation, and Kratos Defense & Security Solutions, Inc. are some of the major players operating in the target drone market profiled in this study. Various players are focusing on the development of novel and highly advanced target drones. For instance, in 2017, Leonardo S.p.a. introduced its aerial target drone named “Mirach-40” to the market at the Paris Air Show. The novel aerial target drone is designed to provide medium-to-high performance at a reasonable price compared to its competitors. Furthermore, it also supports armed forces training by simulating a range of airborne threat targets.